Lovely Blooms Wall Art is a beautiful two-piece floral set that will add beauty and chic to your bedroom living room. The flower wall art set is printed on canvas and hand embellished to give a hand painted feel. 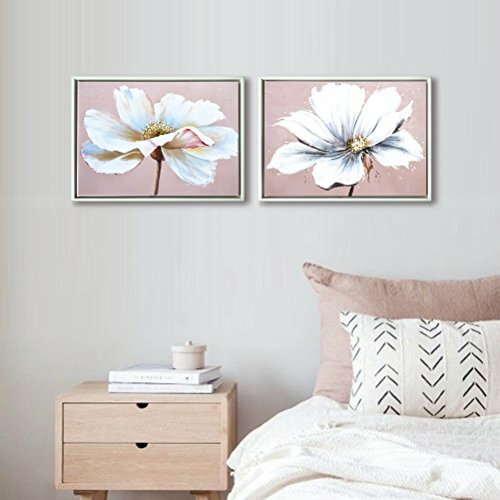 APPLICATIONS: This modern small pink flower wall art uses for living room, bedroom, bathroom,nursery, kids room,kitchen, dining room, hallway, guest room, sitting room, office, dorm, hotel, cafe, restaurant, bar, guesthouse or upon fireplace, power room,behind couch in your nice house. Our flower canvas wall art comes already wraped with bracket mounted frame and ready to hang. All you need to do is find a nail and hang up this beautiful picture in your new home. CUSTOMIZED PRINTING: Our canvas prints can also be custom-made for your own size, photos or pictures, contact us by ""Sold by Aitesi Art "" then ""Ask a question""! About services Each wall art comes with a 100% satisfaction guarantee. If you're not happy with it (for any reason! ), you can return it for a full refund any time. If you have any problem,feel free to contact us!" ❤ FLOWER CANVAS PRINTS WITH HAND PAINTED TEXTURE. These abstract floral canvas wall art are not just a canvas prints,they are hand painted oil texture on canvas by our professional artists. Looking special and beautiful. ❤ ELEGANT WHITE FRAME(EASY TO HANG): 2 pieces set modern floral canvas wall art are stretched over wooden stretchers then encased in white frame. Each canvas art work for home walls has a hook. It is ready for hanging as soon as it shows up. ❤ ORIGINAL ART DESIGN: Each floral artwork is designed by Aitesi Art. All of our canvas art pictures are unique for you. ❤ BRIGHTEN UP YOUR WALL: A perfect wall decor idea for home living room bedroom kitchen dining room bar hotel restaurant office girl room nursery. This 2 piece flower wall art are perfect as an home warming gifts idea. ❤ 100% SATISFACTION GUARANTEE: Once your white and pastel pink floral wall art arrives, if you're not happy with it (for any reason! ), you can return it for a full refund any time. If you have any questions about this product by Aitesi Art, contact us by completing and submitting the form below. If you are looking for a specif part number, please include it with your message.